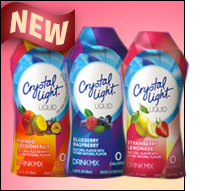 Liquid Crystal Light, Extra HG Content, Online Snack Finds & MORE! Need a little more HG in your life? We're here to help! And listen up, Weight Watchers enthusiasts: There's a new "Hungry Girl Goes..." column every single week over on WeightWatchers.com -- click here to see where she's been and where she's going! In TV news, don't miss Lisa on The View today (Monday, 2/18)! She'll be celebrating Presidents' Day with decadent recipes from HUNGRY GIRL TO THE MAX!, so tune in at 11am/10c. Last but not least, a book-signing event! If you are in San Francisco (or can get there this week! ), don't miss the Hungry Girl event this Thursday (2/21)! Join Lisa at the Safeway on Marina Blvd. from 6 - 8 p.m. for free snacks, fun prizes, Q&A, and MORE. Hope to see you there! Get Your Snack Fix from the Internet! Worth Ordering Online: Crispy Snack Edition! Bell Plantation PBthins Peanut Butter Crackers - We just tried these cookie-like items last week and, OH BOY, we're in love. They're made by the same folks behind PB2 powdered peanut butter, which means you can purchase both at once! Each single-serving packet has only 100 calories and 4g fat (PointsPlus® value 3*). Order up! BettaSnax Original Biscotti - These crunchy, nutty cookie slices are great paired with coffee or tea! A 1-oz. serving (about 9 biscotti) has just 90 calories and 3g fat (PointsPlus® value 2*). If you're buying online, we suggest going in on an order with some buddies, since each bundle includes 12 multi-serving bags. However, you can find them in some gourmet and natural-food stores! The Original Carlsbad Oblaten Classic Dessert Wafers - Looking for something a little different? These super-thin wafers NEED to be in your life. They're light, sweet, and all-around amazing. There are many flavors to choose from: Strawberry, Cinnamon, Chocolate, and more. The Caramel flavor is our fave! Eat 7 wedges for only 60 calories and 1g fat (PointsPlus® value 2*). Bonus: There's a variety of package sizes available, including a single-serving (1-oz.) option! Order online, or look for them at T.J. Maxx and Marshalls locations. ALERT! 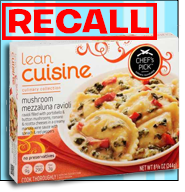 Select packages of Lean Cuisine Culinary Collection Mushroom Mezzaluna Ravioli have been recalled. Nestlé Prepared Foods issued the voluntary recall due to the possible presence of glass fragments. Click here for all of the info, and check your "proof of purchase" panel before you dig in. ***Sure, we know men and women are different, but what are the differences when it comes to DESSERT? GrubHub analyzed takeout orders from the last six months and found that women are 25 percent more likely to order dessert than men. When it comes to dessert preferences, men chose milkshakes and cookies more often than the ladies, and women were more likely to order frozen yogurt, ice cream, and fried desserts. The great equalizer? Cake, which accounted for more than 25 percent of all dessert orders. ***Eggs are shaking their bad dietary reputation! Researchers recently examined studies including subjects in the hundreds of thousands and found no evidence that eating an egg a day increased a person's risk of heart disease or stroke. An exception was found when it came to heart disease for subjects with diabetes, but there were too few diabetics in the study for conclusive results. Egg-ceptionally interesting! ***The day is coming -- the deadline for the Food and Drug Administration's rule requiring nutrition labeling for standard menu items in chain restaurants and similar food establishments is THIS April. Plenty of chains are on it already, but those stragglers better pull it together fast... We'll be waiting! And that's all we've got. HG out! HEADS UP, Lean Cuisine Lovers! Give your buddies some reading material -- click "Send to a Friend" now! Happy Presidents' Day, fellow Americans! Check out this page of presidential favorite foods. Apparently George Washington LOVED fish and nuts -- bet he would've loved some Berry-Good Almond-Panko Tilapia!